This episode was rather breezy and hilarious. We briefly touched on more sombre things, which we will no doubt gain a lot of angst for later on, but for now the joy is going strong and my cheeks hurt from smiling and laughing so much! It’s D-Day and SongAh is making herself (more) beautiful as part of her battle plan preparation. Meanwhile, at Flada, SooRi is reading SongAh’s work contract (which has been taped to the wall haha) and he is shocked at the 100 hours. BiRyong says that SongAh seemed nice so this sounds harsh, SooRi jokes that he must like her. A flustered BiRyong tells him that she isn’t his style, to which SooRi agrees saying she is short and flat chested. GookDae, who has been listening intently, hits SooRi. SooRi then asks why he is employing a female, as he vowed never to do so. GookDae says she is only a part timer and is filling the place of Meng Dal (who is in Europe) until he comes back. While GookDae is judging SooRi, SongAh enters FLada and makes them all go gooey. BiRyong smiles widely and tells her to call him by his name, SooRi waves cutely and even GookDae has to shake his head to clear his mind, which he does quickly to tell her off for being late and childish. GookDae breaks up the conversation by ordering her to peel garlic. On the counter, he bangs down a pot of garlic cloves. 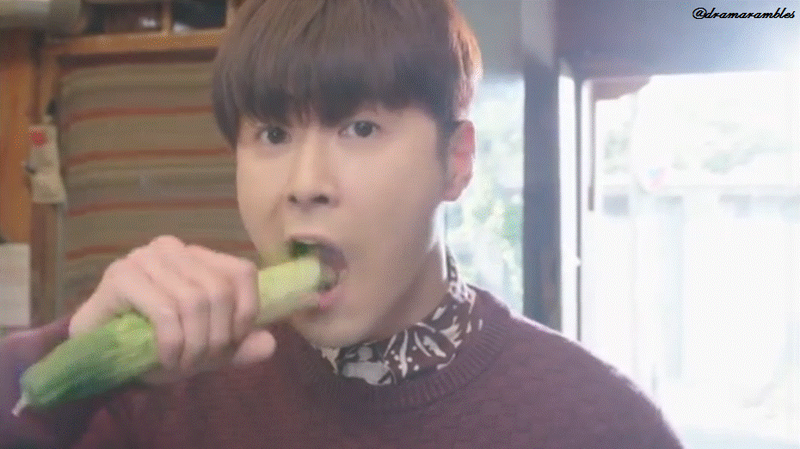 SongAh picks one up and tells him she saw how to cut them once on television. The screen is then transformed to ‘FLada shopping’ where ‘Park SongAh’s secret garlic peeling tip is being made public’. BiRyong and SooRi are impressed by her knowledge, telling her they both had to do this because it is “GookDae Hyung’s Newcomer Test.” SongAh confidently asks what she should do next and GookDae reaches to touch her bangs, however, SongAh angrily swats his hand away. She asks why he is touching her hair, which he responds by telling her that he was just saying that she should tie her hair up as she is working in a kitchen. SongAh tells GookDae she has a scar on her forehead which is why she has her bangs and tells him not to touch her so freely. As SongAh wants to maintain her image in front of BiRyong and SooRi, GookDae tells them that they should avoid her, so she’s working alone. She grudgingly goes to remove her makeup when GookDae tells her to do so immediately. While she silently screams and stomps around in the changing booth, she suddenly hears voices. SooRi is ecstatic at being able to leave, while BiRyong is hesitant at leaving her to prep all the food by herself. Much to SongAh’s disappointment, GookDae persuades BiRyong to go out and buy ingredients as SongAh told them that she would be uncomfortable with him there. SongAh comes hesitantly out of the changing room and asks if he is satisfied. GookDae tells her to take her clothes off, which brings back the giggly SongAh. Of course GookDae’s reasoning is that her clothes aren’t suitable. He orders her to follow him, but on the way SongAh gets distracted by the bookcases containing comics and fairy tales. GookDae asks if she likes them and comes close to her, which makes the situation turn a little awkward. 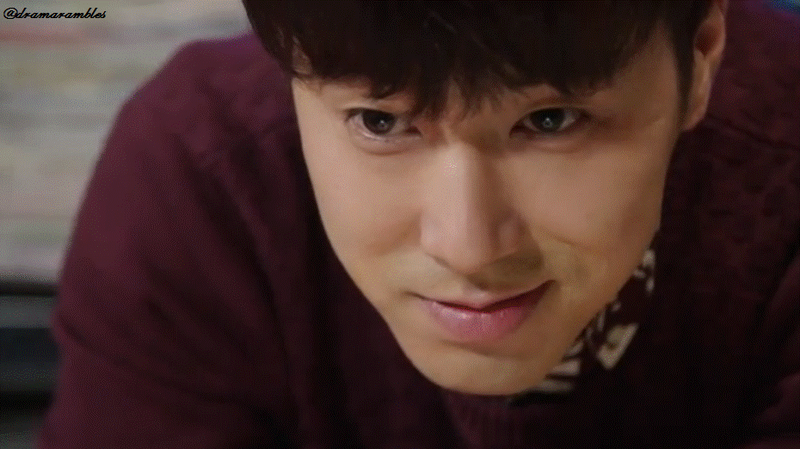 He tells SongAh that she can borrow some, but not to mix up the order. GookDae wanders off, not sure if he even has clothes which will fit her. While in a different room, SongAh watches GookDae peruse a rack of clothes. She suddenly starts to daydream about seducing a drooling GookDae (I love her imagination so much!). Her daydream is cut short when GookDae hands her some clothes, saying they will be a bit big. 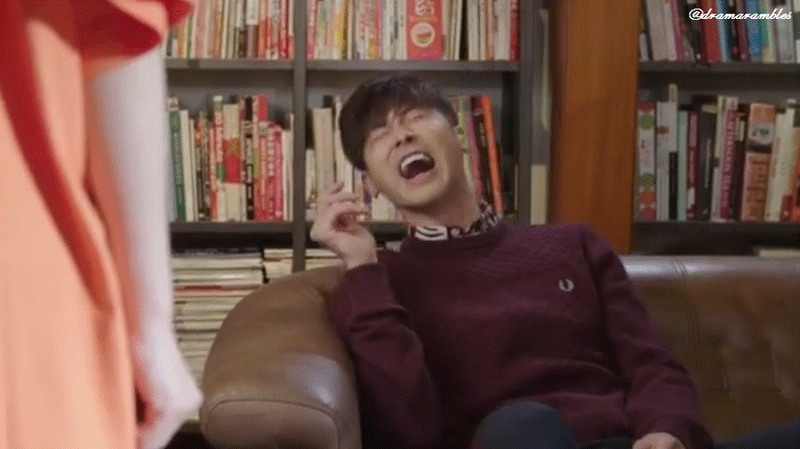 When she comes out after changing, looking glum, GookDae immediately starts laughing. He even calls her a ‘hip hop warrior’ which extremely amuses him. Meanwhile, SongAh sulks and tells him to stop. When he tries to regain his “usual” behaviour, he sniggers while leading her back to the garlic prep (I’m not going to lie, I rewatched this bit about 5 times! So cute~♥). During the day SongAh peels and washes the ingredients GookDae sends her way and by evening she is unimpressed with the whole situation. While building a cardboard lunchbox she grumbles that she should basically ‘give him what for’. Her seething is interrupted by GookDae congratulating her on her hard work and offering to reward her by making her a legendary meal from a comic book. After GookDae is caught coyly complimenting himself by SongAh, he asks her if she never imagined things when she was younger. Her response is ‘a house made of cookies’, they both simultaneously say ‘Hansel and Gretel’ and then when she thinks about the tastiest cookie flavour, they both say ‘chocolate’. (This is so cute, I can’t even right now! Is this a dream? He’s being so cute and nice. Talk about whiplash, I’m just waiting for it to go wrong haha ^^”). GookDae tells her that next time he will make her a tasty biscuit, but for now she should have the honour of eating what he prepared. SongAh takes a bite of tofu and when prompted twice to say how it is, she replies that it’s the same as how her mother makes it. 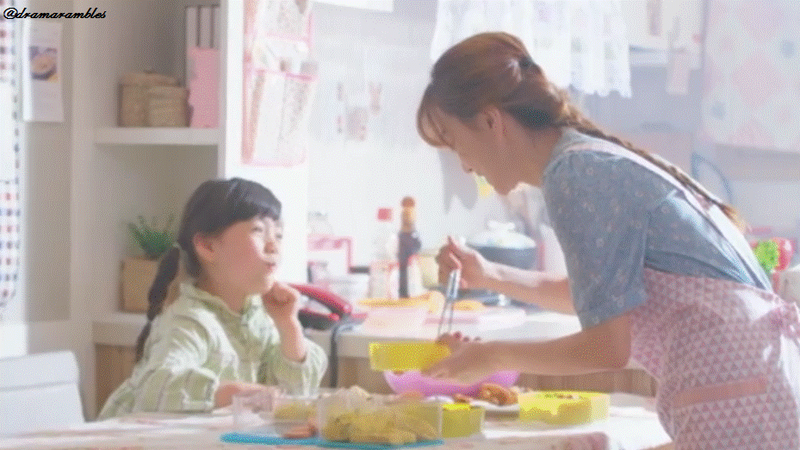 We are then taken back into SongAh’s childhood memory of her happily watching her mother cook. Back in the present, SongAh tells GookDae that his lunchbox meal tastes like her mothers and she asks if she can take some home for her brother. SongAh is happy to hear that he will make a separate one for her brother. She then reminisces that the first lunchbox of his she tried also tasted like her mothers. He jokes that that is something most men say to pick up women (her ‘omo’ was so cute). Right then she deems it time to leave. After handing her the packed lunchbox, GookDae tells her to come over whenever she thinks of her mother. When they say goodbye, he cutely says her full name which causes her to try to steady her heart when finally outside (they are so cute! :3). 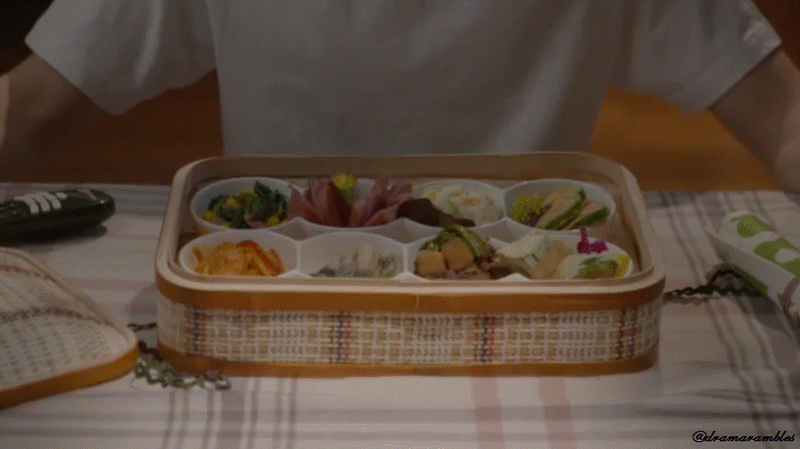 At home, SongJoo puts the stamp of approval on the taste of the lunchbox and wants to be introduced to the chef. 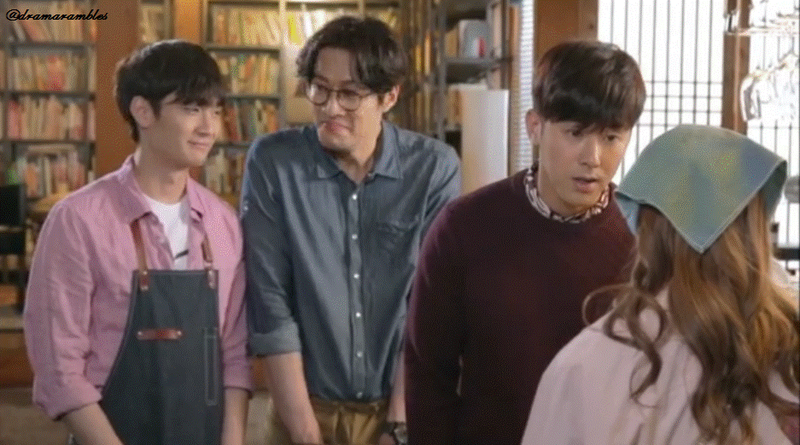 SongAh lets him down by saying that the chef is a man (he thought Boss Yeo was a woman). SongJoo then wonders why a man is making her lunchboxes. SongJoo tells SongAh to be cautious as “all men are trash” (hahaha). He tells her that he will pay for the broken dish, but when SongAh tells him she will go to work there tomorrow, he agrees. SongAh goes to hit him, but SongJoo’s bodyguard training comes in handy. He suddenly then remembers something, “Tomorrow is Monday”. SongAh, who is late, gets scolded as she was specifically told to be punctual today as the new Team Leader was arriving. DoekHee relates to SongAh that the new Team Leader is selfish, as not only is he handsome but is also gentle (I’m assuming this means he’s nice haha). While the two are busy in the kitchen area DoekHee continues to gush over the new Team Leader – Kevin Joo (Jang SeungJo). Finally changing the subject, DoekHee asks after SongAh’s ‘owner’ as she remembers her telling her about the slave contract. 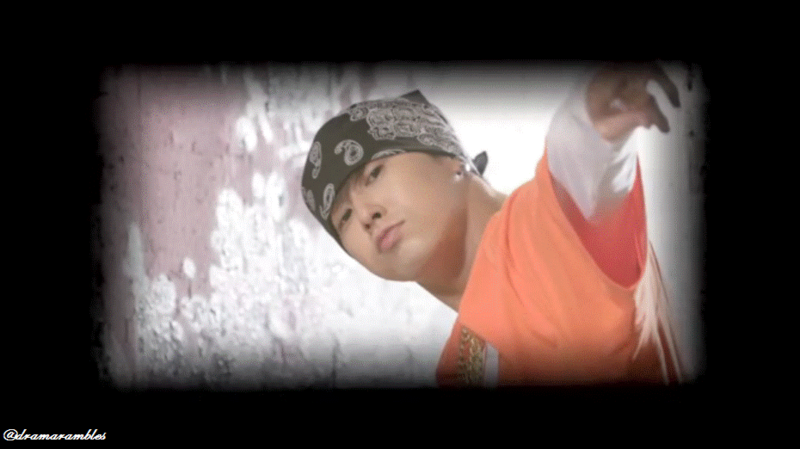 One nice guy ~ BiRyong! One weird guy ~ SooRi! SongAh assures DoekHee that if there were any cool guys, she would have shared the information, saying that is what she had hoped for as well. While SongAh is savouring a bite of a strawberry, DoekHee carries out a tray of coffee, and isnreplaced by none other than Kevin Joo. Oblivious to this change, SongAh holds a strawberry over her shoulder for DoekHee, of which Kevin has no qualms of taking a bite of. SongAh turns round and is shocked to find a smiley Kevin in front of her. GookDae. He is definitely a little confusing. His moods shift rather rapidly, but to be honest when he was super sweet to her I wasn’t weirded out by it that much. I mean, yes I did think something was going to go wrong or she was dreaming, but in retrospect, we kind of already have got the sense that he likes her and those scenes were just too cute and fluffy. We also met our second male lead, Kevin Joo. He seems very smiley and cute and from the teaser it looks like things are going to heat up very rapidly between the main lead and second male lead. Hopefully it keeps being fun though!